Meowmy said I should come in here and let folks know that I'm going fishing for awhile, so the blog is mostly on vacation with me. 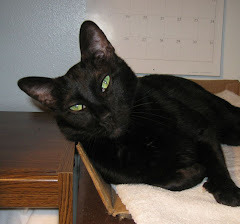 Since there are so SOOOOOOOOO many shelter cats, that Shelter Cat Saturday feature is stayin'. I told her I didn't care HOW much time she was spending on rescue THIS needed to stay...plus, it's rescue, too! So maybe I'll be blogging again in a few months. Time off may be just what I need. Ollie is right. I've gotten very involved networking rescue animals and trying to get Animals First Foundation of Texas organized and purposed, and the blog is suffering because of it. He's also right that Shelter Cat Saturday is rescue oriented and that should stay open. So SCS will be here, and it may be there will be another day added to that feature, too. 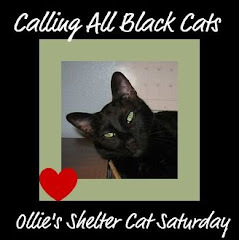 The requirements will stay the same...black or mostly black cats (including torties) will be featured. It's good work you are doing, Donna! We very much appreciate that. If his nibs is too P.O.ed to give good photo ops, then so be it. We will miss you both! Have a great Summer!